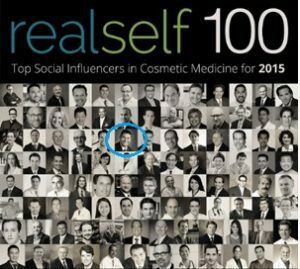 Say “hello” to the top 100 plastic surgeons, facial plastic surgeons, and dermatologists who have committed to patient education and positive patient outcomes, according to RealSelf. The top 100 list is based on positive reviews from patients posted on the RealSelf website. “When we started RealSelf, many doctors questioned why they should ‘give away’ their expertise ‘for free’ on the web,” says Tom Seery, RealSelf founder and CEO, in a media release from the company. “Now, 9 years later — and with over 1 million doctor answers on our platform — we are proud of the standard this select group has set. They’re leading the way by empowering millions of consumers to gain access to the information they need to make smart and confident health and beauty decisions,” he adds. RealSelf has also compiled RealSelf500, which includes 400 additional physicians who have also helped contribute to the consumer education offered on the RealSelf site. In 2015, these 500 doctors, collectively, have contributed nearly 30% of the physician content posted on RealSelf, per the release. For more information, visit RealSelf.